Three thousand years old the Uffington White Horse is one of the more distinct of the many hill figures and chalk figures that dot the English countryside. The White Horse has given rise to many a theory as to the reason it was created; everything from a mystic symbol of power to a road-side advert for a horse market, all contributing to the overall air of mystery for the White Horse Myth. Horses play a strong role in many of the myths originating from the United Kingdom. The riders of the Sidhe, kelpie, the steeds of the Knights of the Round Table- the list goes on. Certainly the presence of a horse like figure cut into the chalk hills near Uffington preserving for millennium must have some influence on that. The White Horse of Uffington has been a source of local pride for as long as there have been locals, and while there are a few mysterious legends about where it came from and what it might mean, most seem content with preserving the landmark and enjoying its existence. Is it a Horse, or a Dragon? Interestingly, a number of the locals don’t think it is a horse at all, but rather a dragon. Not just any dragon, but the dragon killed by legendary St. George the dragon slayer—yet the deed itself is reported to have taken place at nearby Dragon Hill. Upon this hill a bare patch of earth refuses to grow grass, the spot the legend says the dragon’s blood was spilled. Yet, despite some locals insistence, even they call the area the White Horse hills, perhaps conceding the point in order to keep up the tourist value. The figure on the hill was dated in 1994 using a luminescence dating method, at which point it was determined to have persisted since the Bronze Age, putting it around three thousand years old. Because the chalk that gives the image such clear white lines can be so easily obscured by natural elements, the White Horse of Uffington would be all but invisible if not for a regular scouring. In fact there used to be a custom of doing just that ever seven years, during which time the locals would hold a fair. Neopagan significance has been attributed to the White Horse, making it a symbol of power to some. Many a writer has taken inspiration from this and added it to their stories- but some additions regarding the White Horse were not welcome. In 2000 the area was defaced when some added a rider and three dogs to the scene, which were subsequently obliterated. Some credit the creation of the White Horse to territorial marking. 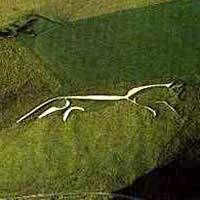 It is thought that a tribal people living in the hills of the time used the horse as their tribal symbol, and thus declared the area “White Horse lands”- these same people were thought to have gone on to build the Iron Age Uffington Castle nearby. A more mundane but interesting theory is that a horse market was part of the area, and merchants carved the White Horse into the hills as a form of ancient marketing.